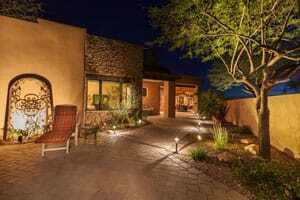 Landscape Lighting is a fantastic way to transform the look of your house and garden at night, improve security, boost up your home’s curb appeal, and make the neighbors want what you’ve got! We can advise, recommend and install an entire range of landscape lighting including deck lights, floodlights, path lights, post cap lights (for deck posts), spotlights, well lights and more. You can choose Smart Lighting’ options which may be controlled from your phone or mobile device, Timed Lighting which which will come on when it gets dark and automatically switch off after the duration you choose, and LED Lights which save money and endure the weather for year after year! We can install beautiful lights in your swimming pool, hot tubs, patio, and any outdoor living space. Whether you are looking for a fantastic ambience for your next garden party, a romantic lighting mood for just after sunset, an outdoor night-time home basketball floodlight…you think of it and we can do it! Light up your life with A.D.I. Electrical Services.